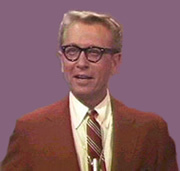 A game show hosted by Allen Ludden that pits two teams, each made up of a celebrity and a contestant, against one another. A secret word is given to one player from each team and they try to help their partner guess the word via single word clues. The first team to reach 25 points wins the game and moves on to a lightning round worth up to $250. This is the first of many incarnations of the Password game show.